In a previous post I have shown how to teach LightZone, a non-destructive photo editor, to open files passed from the command-line (for some strange reason it doesn't do it out-of-the-box). Now, I want to be able to use LightZone as an external editor from F-Spot, which I use for my photo workflow. F-Spot has a convenient Open With menu when right-clicking on a photo, we just need to add LightZone to this menu. After some research, it appear that F-Spot uses the standard desktop entry specification files to populate this menu. These files can be located either in /usr/share/applications or in user's home, ~/.local/share/applications. You can use either location, but I prefer the latter one, because I have unpacked LightZone into my home as well. This file expects that you have followed the previous post and already have LightZone in the PATH which accepts a filename to open on the command-line. Exec - this line specifies what command to run, %u means to pass the selected file's URL on the command-line. For some reason with trial and error, I found that F-Spot is only able to pass URLs like this, specifying %f doesn't work with F-Spot. But if you look at the LightZoneOpener.java source, you will see that it supports URLs as well as filenames. Icon - change this one to the full path of LightZone's icon, it supplied in the original archive. Categories - this specifies where LightZone will appear in the ''Applications'' menu. MimeType - here you must list all image mime types that you want LightZone to open. This is especially important for RAW files. As I own a Canon camera, I have most of my photos in CR2 format, so I need to be sure that image/x-canon-cr2 is in the list. I have also specified CRW, NEF and PEF mime types for older Canon, Nikon and Pentax cameras, respectively. These mime types are already registered in Ubuntu Intrepid (not sure about other distributions). Here is some info on how to register new mime types in Gnome, in case your camera's format is not registered yet. After chosing the Open With->LightZone, F-Spot will ask whether to create a new version for the file. Select 'No' - this won't work with RAW files and LightZone anyway, because LightZone saves files automatically with the _lzn.jpg suffix and F-Spot doesn't know about it. Getting this right requires patching F-Spot (I am going to do that later). For now, you will have to import the saved file manually, if you want it to appear in F-Spot. I doesn't work for me. It works from command line but not from F-Spot. 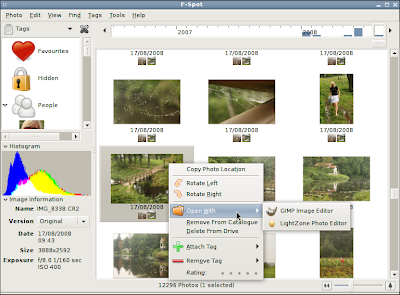 It shows open with Gimp but not with LightZone. I don't know why. F-Spot is very sensitive to launcher configuration in lightzone.desktop, unfortunately. Try exactly the same file that I've got. Nice post and this enter helped me alot in my college assignement. Thank you seeking your information. Opulently I assent to but I dream the post should acquire more info then it has. intent not mend herpes infections; it choice help the sores rejuvenate faster and expropriate to ease the torment or discomfort. What should I tell my healthiness distress provider ahead I gain possession of this medicine? Approvingly your article helped me terribly much in my college assignment. Hats high to you post, will look ahead in behalf of more interrelated articles promptly as its united of my choice issue to read.